The furniture project today was a custom makeover. 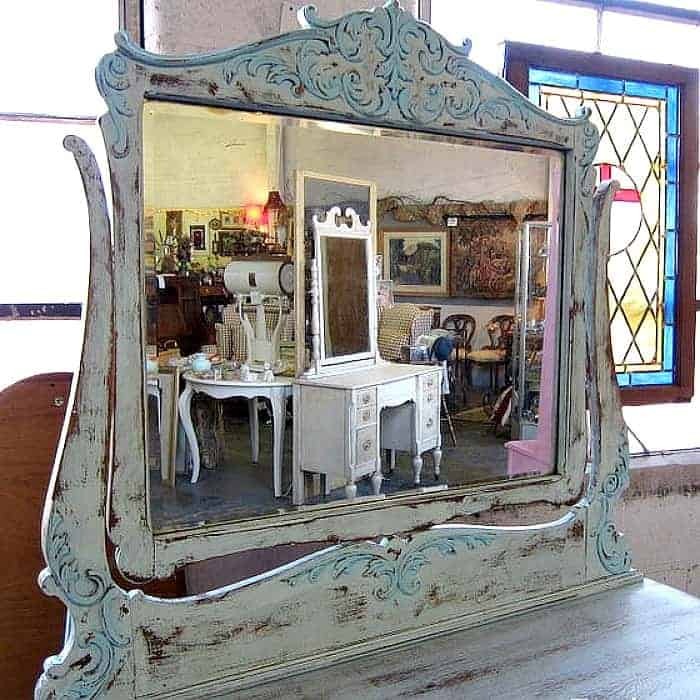 The dresser with mirror is an antique and has beautiful curvy swirly wood appliques. 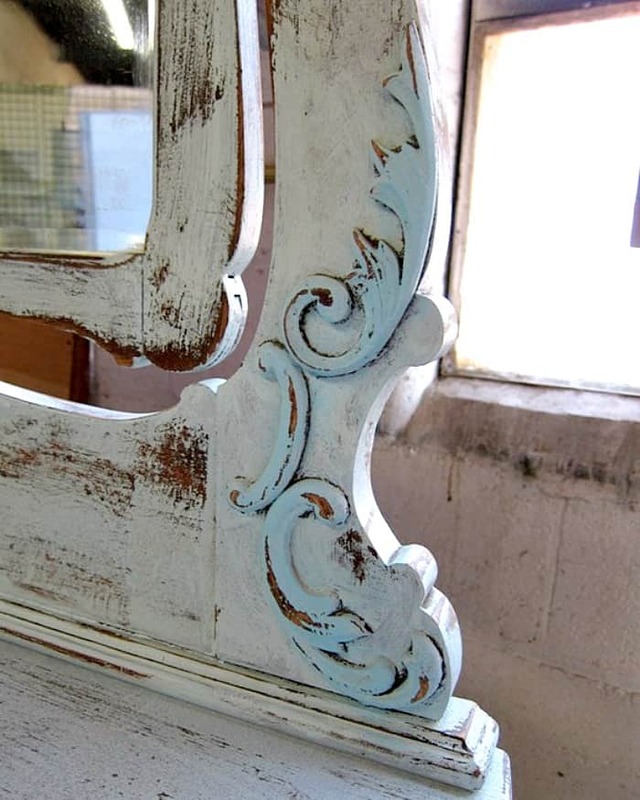 The client requested a two tone turquoise paint finish…..and heavy distressing. The client had a vision and it worked. 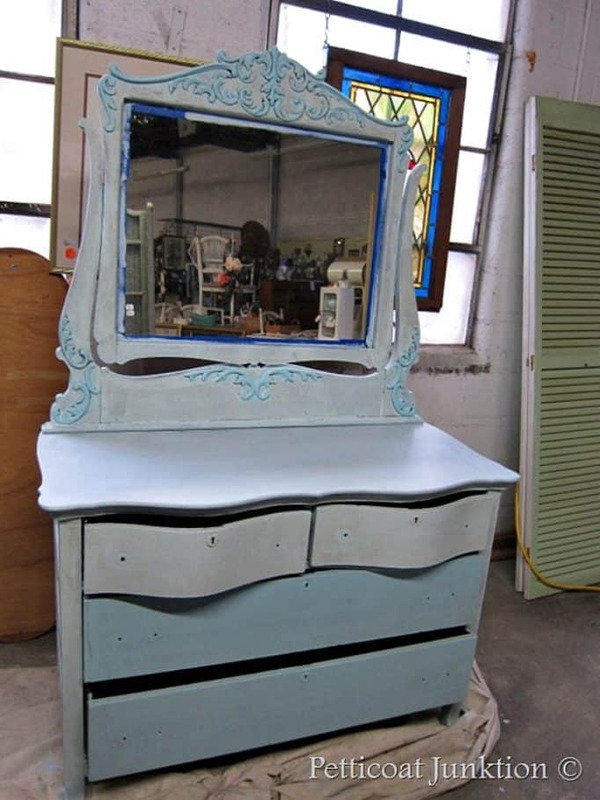 Two tone turquoise was the perfect paint finish for this piece. I highlighted the wood details with a dark turquoise for nice contrast. I know the distressed paint is a bit over the top for some of you but that is what the client requested. This is how the dresser looked before painting. The customer purchased it at the shop next door to the store where my booth is located. I painted the dresser at the shop. I used to do that a lot. In fact this makeover is from February 2012. I found the photos in an online album where I apparently saved them along with some other photos. It’s a pretty cool piece and a nice makeover so I thought I would share it with you. I can’t believe it’s been 7 years since I painted it. Time flies. 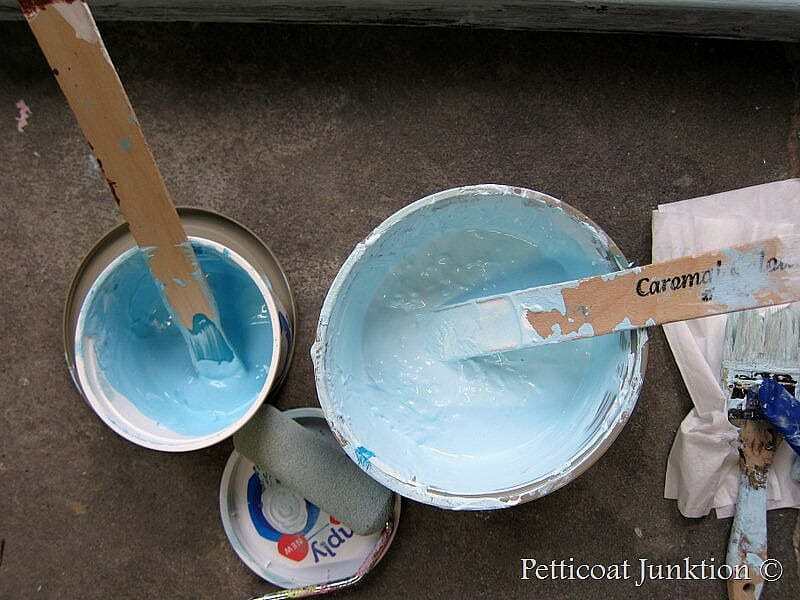 The paint is Beyond Paint in White and I used those little bottles of acrylic paint to make the two shades of turquoise. I like mixing my own paint colors. You can find my custom Junktion Red paint here along with the formula. 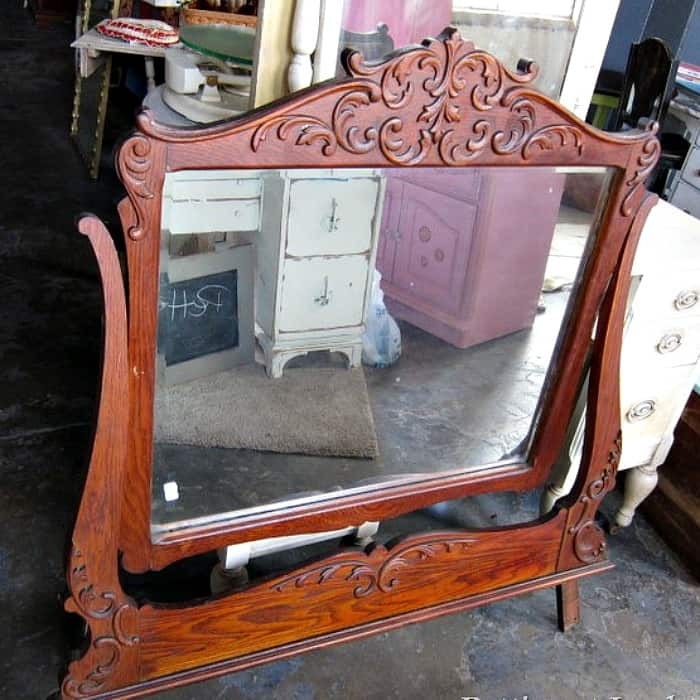 The wood details on the mirror were in perfect condition. A lot of times the curly cue tips have been broken off. 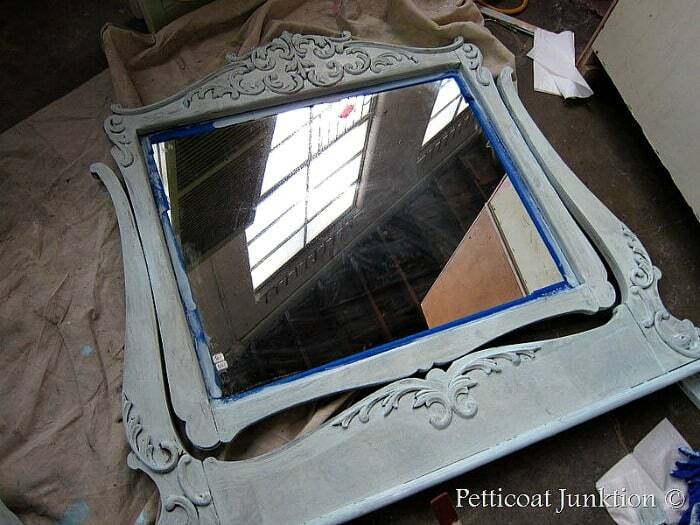 I removed the mirror from the dresser before painting it. I’m not a neat painter so I applied painter’s tape around the edges of the mirror. That’s easier than scraping off dried paint. I used the darker turquoise paint on the bottom two drawers and the detailed appliques. The darker turquoise really highlights the curvy wood pieces. An electric sander was the only way to go for this project. The pointy mouse sander was a good choice for getting into those small curvy areas. I used 60 grit sandpaper in order to remove a lot of paint. 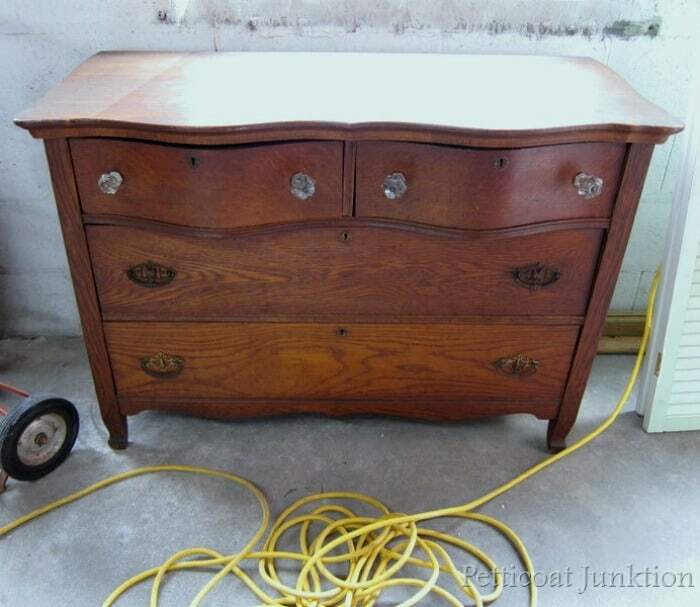 The antique dresser had wheels. I removed them for clean up and oiling. Close up look at the details. 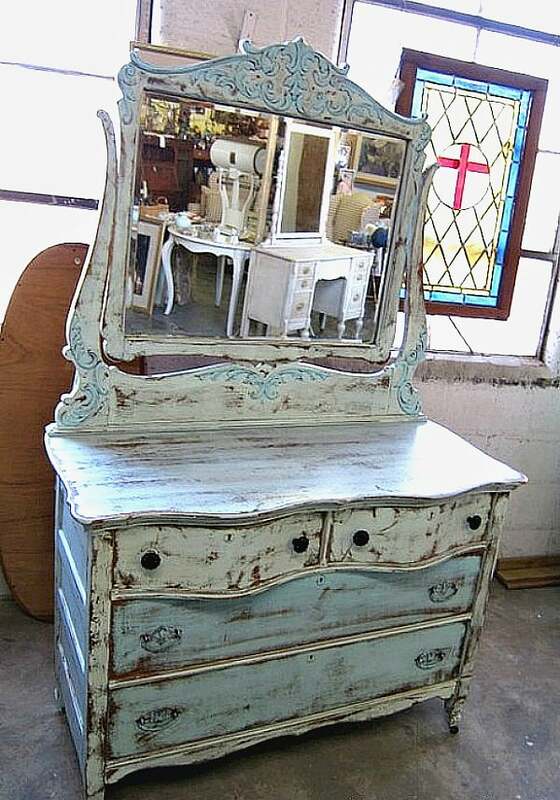 If I were to do a similar piece now I would use a neutral or dark wax to darken the raw wood caused by the distressing. I would also be more precise with the distressing. Using an electric sander leaves weird looking “sanded” areas if you aren’t careful. I don’t mind admitting that I mess up…..which I do a lot. In this case I’ve learned through trial and error and years of furniture makeovers how to use the sander and get a more authentic looking distressed finish. The knobs on the top two drawers were big and glass and didn’t look too good with the new paint. I purchased 4 new knobs at Hobby Lobby and I thought they would be perfect. The color was nice but they stuck out too far and the curvature of the dresser drawer made them sit at a weird angle. So I made a trip home to pick up some plain old brown knobs from my hardware stash. 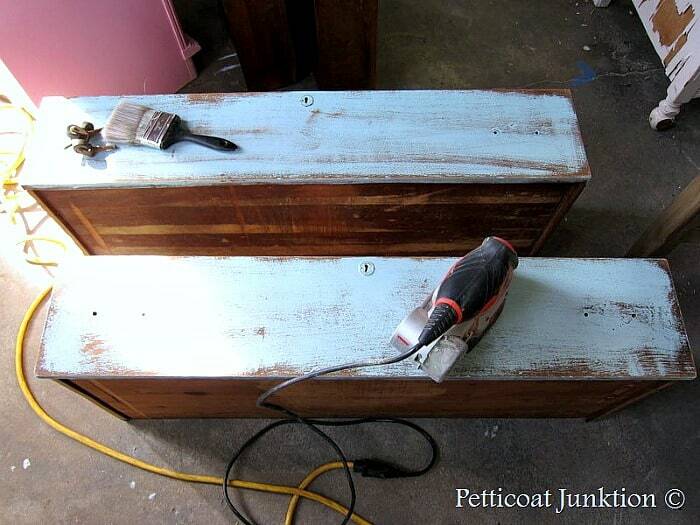 If you like this makeover you will love the Black Aged And Distressed Vintage Dresser here. 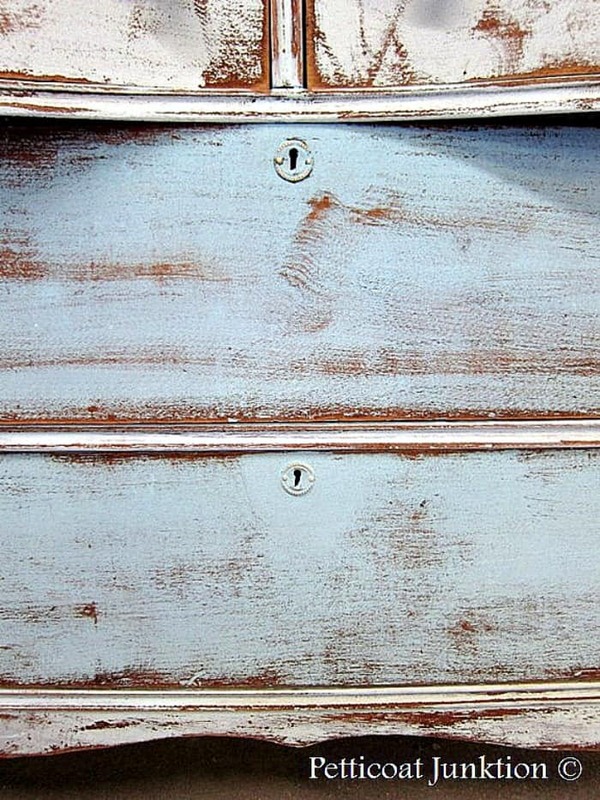 I painted the original drawer pulls on the bottom two drawers using the turquoise paint. The client was happy and that makes me happy. I love the finish. Do you like it? What about the color? Too much distressing? How about seeing my older paint projects. Like it or not? Most of you probably haven’t seen my earlier work. I don’t care for this level of distress. It becomes a third color and makes the piece too busy for me. I would have preferred just the grayish blue and the distressing. It appears too forced somehow. Just my taste. Just too busy, love the curve but would have kept it all one color. Great job on this! One of my favorite pieces. It’s gorgeous and the colors are perfect. Pinned to my Furniture board. Love colors but not too hip on the high amount of distress. This has so much more personality now . I’m usually not a fan of distressing but it’s perfect for this piece . Colors are to die for . You nailed it ! Good job ! 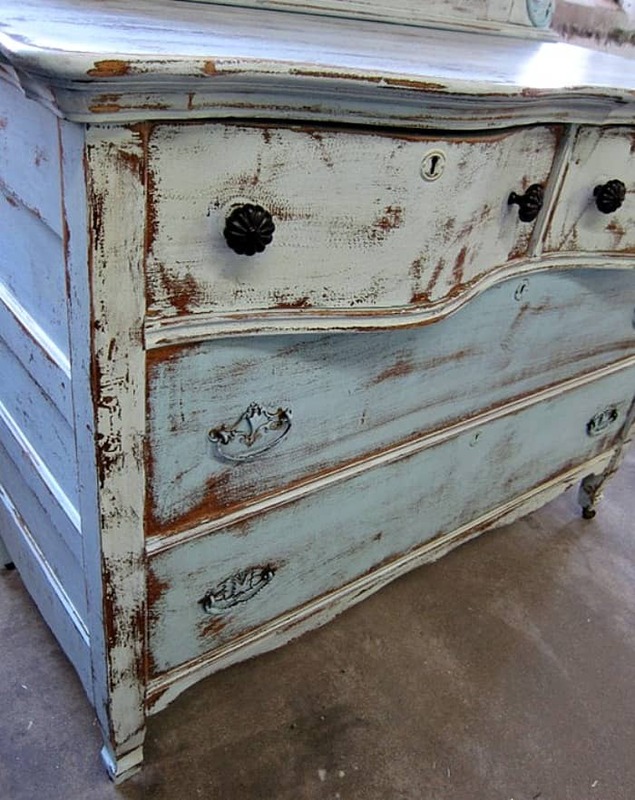 Love the distressing on this piece!! 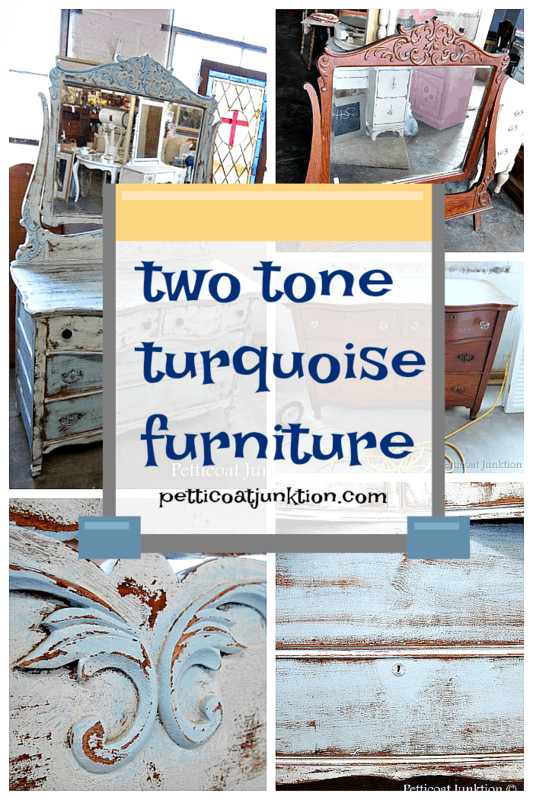 LOVE your painted furniture pieces. I see your in Clarksville, TN…….do you sell in a shop there. Im in Lawrenceburg, TN, bout 90 miles south of Nashville. I'll be back soon to see what else you've painted!!! Beautiful!! I absolutely love the colors. I'm stopping over from MMS link party! I think the dresser turned out great….there's nothing better than a happy client!! Okay… you did it again 🙂 This piece is absolutely gorgeous! Love it! OH yes I like it! This turned out so fabulous!! Great job! This looks great!!! 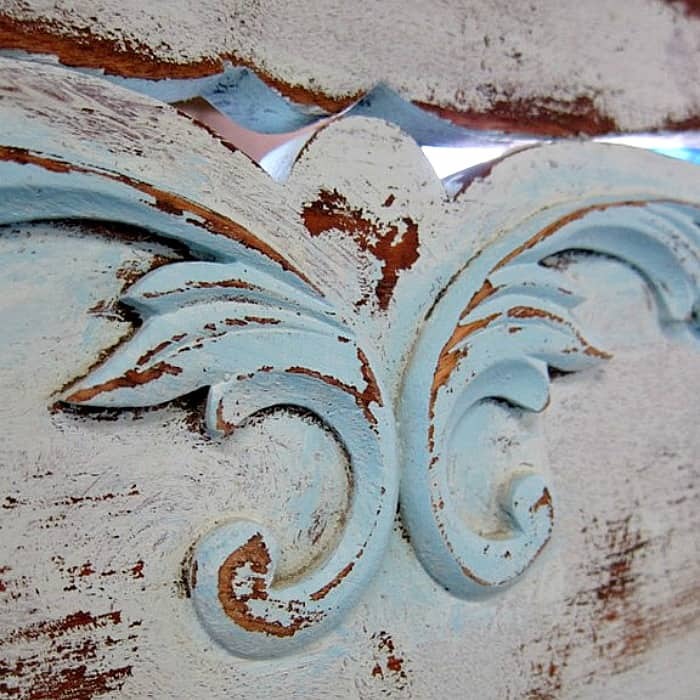 Is this chalk paint? If not, what kind of paint did you use? 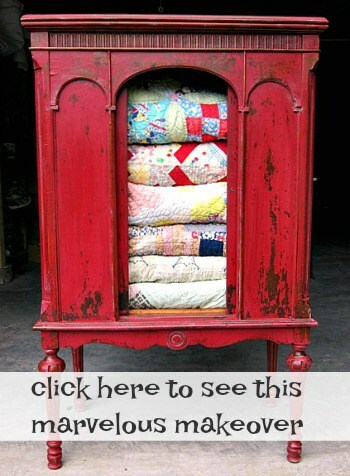 Oh I just ADORE this dresser!!! 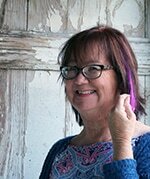 Saw it on Domestically Speaking spotlight party. I am your newest follower. Cant wait to see what you do next. Gorgeous!!! I'm putting it in the PoPP Spotlight this weekend. Thanks for linking up. I'd love for you to submit your project to my new site too, powerofpaint.net . omgoodness, this is so fab! you know i love me some aqua! 🙂 great job, kathy! I love the two colors together. The piece is lovely! Absolutely beautiful! I have yet to distress a piece this much,but I am drooling over the finished dresser. Great job! Very pretty love the 2 tones seems like this is a new trend I love it. that piece is stunning! You are talented!